This Disability Compensation claim process map outlines the steps involved in the disability compensation claim process including how much time is required for each step. Applications for disability compensation are processed using the Claims Processing Improvement (CPI) model. The CPI model was developed in 2001 by the Claims Processing Task Force to increase efficiency in processing disability compensation benefit claims and to reduce the number of errors. The model requires triage of incoming mail and analysis of incoming claims. It promotes specialization that improves quality and expeditious handling of claims. VA employees who process claims for disability compensation are organized into specialized teams that perform the triage, pre-determination, rating and post-determination functions. 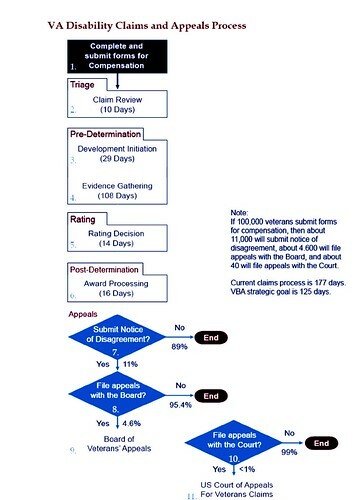 The following describes the sequence of the disability compensation claims and appeals processes. 1. Application: The veteran begins the process by completing and submitting an application for disability compensation benefits with the VBA. 2. Triage: The triage team has the responsibility for reviewing, controlling, and processing all incoming mail. Team members are responsible for deciding whether a claim can be processed immediately or it will need additional development. 4. Pre-Determination: (Evidence Gathering): During this phase, team members obtain all pertinent military medical records. 5. Rating: VA rating specialists make decisions on claims that require consideration of medical evidence. 6. Post-Determination: After a rating specialist has decided a claim for disability compensation, members of the post-determination team process awards for disability compensation benefits and they notify claimants of decisions. 7. Appeals: The primary function of the appeals team is the expeditious processing of appeals and remands. The team is responsible for establishing and monitoring appealed claims, developing issues on appeal and preparing revised ratings when a review indicates that the appeal can be favorably decided based upon the evidence of record. 10- 11. Appeals: If the veteran is not satisfied with a decision rendered by the Board of Veterans’ Appeals, the veteran can file an appeal with the US Court of Appeals for Veterans Claims. Not shown on the chart is the public contact team. VA conducts personal interviews with, and answers telephone calls from, veterans and beneficiaries seeking information regarding benefits and claims. VA directs claims and evidence to triage via personal interviews, telephone calls, e‑mails, and other outreach activities.